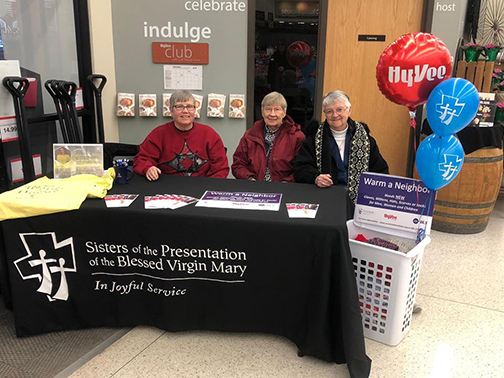 Since 2015, the Aberdeen Presentation Sisters have partnered with Sioux Falls Christian Radio Station, Life 96.5, to focus on our Warm a Neighbor project. Each month, the radio station highlights a non-profit to address a local need. They ask their listeners to help this organization by donating items. 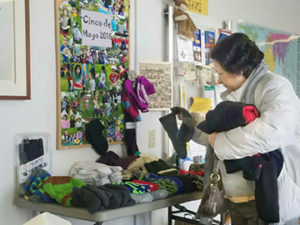 We have been fortunate to grow this partnership each year and be their “January ministry,” collecting warm winter items for clients at Caminando Juntos, our Latino ministry in Sioux Falls. Caminando Juntos is Spanish for “walking together,” and is the name of our Hispanic ministry in the Sioux Falls area. Their primary purpose is to help create a welcoming presence and respond to the needs of the newer Latino immigrants as they seek to integrate into this culture and make a home among us. It has been found that many of the Hispanic people who relocate to Sioux Falls are not prepared for the harshness of the winter climate. They do not have warm gloves, mittens, hats, or scarves to wear. 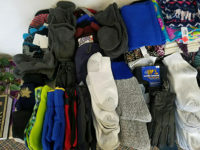 We ask the community for help to provide cold weather accessories for the men, women and children who visit the ministry center for assistance. Our partnerships have grown for this event each year. Hy-Vee has continued to provide their seven Sioux Falls grocery store locations as collection points. They also offer their stores to us for booth space to educate the shoppers on the project and bring awareness to what we are doing and the needs of our community. The energy has been contagious as Coffea Roasterie has also agreed to assist at three locations in Sioux Falls. We are ever grateful to all of the partners, knowing that together we are warming hundreds of neighbors each winter! Assistance to accessing healthcare, education, legal and social service systems. Accompaniment of women and children in abusive relationships. Visitation to homes, hospitals and state penitentiary. Education through English classes and citizenship preparation. Promotion of human rights for Latinos.